Civil rights leader honored in Downtown Phoenix. 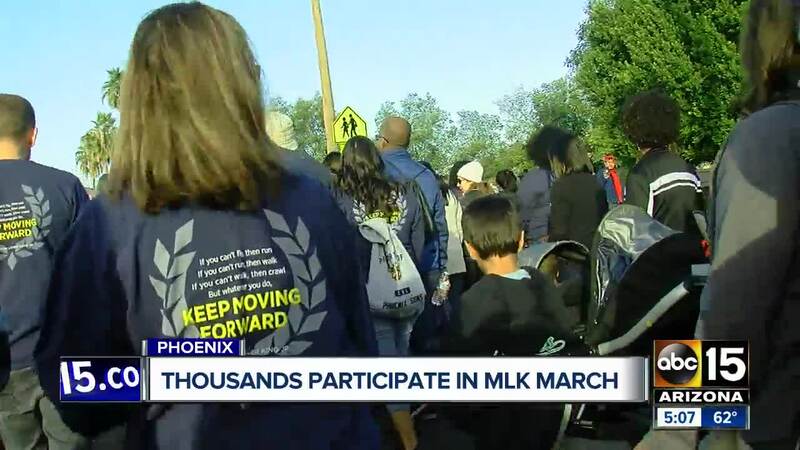 PHOENIX — Several communities around the Valley will honor Dr. Martin Luther King Jr. with celebrations, symbolic marches and unity walks. Throughout the weekend and on Monday, organizations will have community service opportunities for people to participate in to honor the life of Dr. Martin Luther King Jr.
Where: Parade starts on Center Street at Martin Luther King Way, and ends at First Street and Robson. Where: On MacDonald Street, north of Main Street, in Mesa. Zen Nights Inc. is hosting a music and art festival to celebrate the life of Martin Luther King Jr. 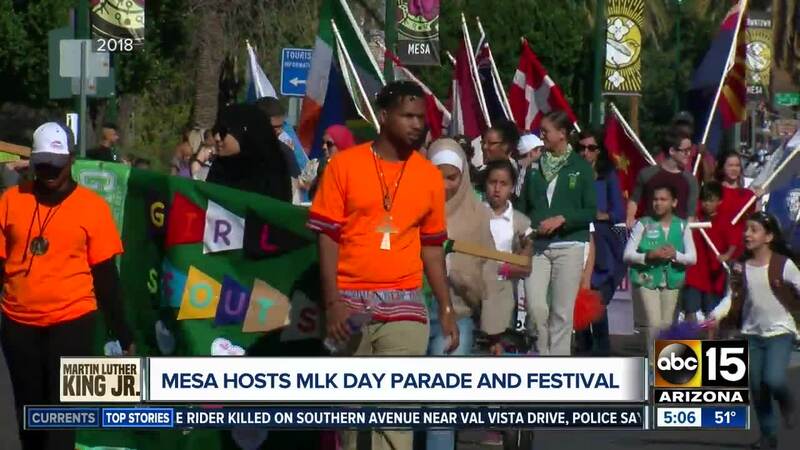 The Arizona Museum of Natural History is also offering half-price admission from 11 a.m. - 4 p.m.
Government officials and community leaders will meet at Pilgrim Rest Baptist Church (meet at 8:30 p.m.) and march to Margaret T. Hance Park where a festival will take place. Where: Meet at plaza in front of City Hall, 8401 W. Monroe Street. Community members and students from Peoria Unified School District will go on a short walk to celebrate unity and peace. On Monday, Jan. 21, Walt Richardson will also have a free concert from 2 p.m. - 5 p.m. at Peoria’s Centennial Plaza. Middle school and ASU students will re-create the historic 1963 March on Washington, while also learning about the civil rights movement. At the end of the march, ASU faculty member Charles St. Clair will deliver Martin Luther King’s famous “I Have a Dream” speech. Time: 4:30 p.m. - 7 p.m.
Tempe, Mesa, Chandler, Phoenix, Scottsdale, Guadalupe and Gilbert will meet at Tempe Beach Park for their annual Regional Unity Walk. Walkers have been asked to bring signs celebrating diversity and unity. There will be "food, free t-shirts, free refreshments, local dignitaries and entertainment," according to Mesa's online calendar.